We have a sandbox here in the office that has a database that we run the Liquibase Database Change Log file (a.k.a. “driver file”) against every now and then. We do not develop against this database since one of its purpose is to ensure that the latest version of the driver file runs without problems. A few days ago, I took a backup of that database and restored it to my local machine. According to the DATABASECHANGELOG table, the driver file was last ran on 17 JUN (see screenshot below). However, when I tried running the latest Liquibase driver file from /develop against my now local db, I got a variety of errors ranging from duplicate key values to tables/columns already existing. An officemate tried to run the latest driver file on his local machine and worked without any problems. We checked the DATABASECHANGELOG table for the existence of the IDs of the changesets and to our surprise, they were already there. The errors being thrown due to the lack of precondition in the changesets are just a manifestation of a different problem altogether (although the lack of precondition on the changeset is a problem on its own). We were able to come to that conclusion because Liquibase will only try and run the changeset if that changeset’s ID is not on the DATABASECHANGELOG table. So why is Liquibase trying to execute a changeset when the ID of the changeset is already in the DATABASECHANGELOG table? The take away is that Liquibase tracks each changeset as a row in the DATABASECHANGELOG table which is composed of the combination of the “id”, “author” and a “filename” column. If we go back to the first screenshot above, you’ll notice that the value for the FILENAME column after 17 JUN 2015 has changed. At this point, it means that I’ve restored a backup of that database to my local machine and the path where I’ve been executing Liquibase is different from the path where Liquibase was being executed on the sandbox in the office. So how did we solve the problem? 2.) Made modifications on the way we were executing the driver file moving forward so that the FILENAME column only contains that – the filename without paths. 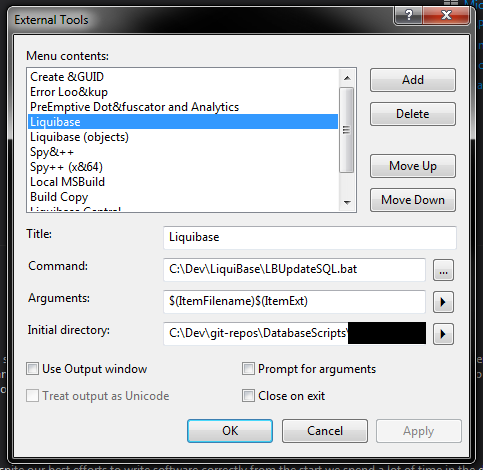 (How To: Execute Liquibase Database Change Log file (a.k.a. 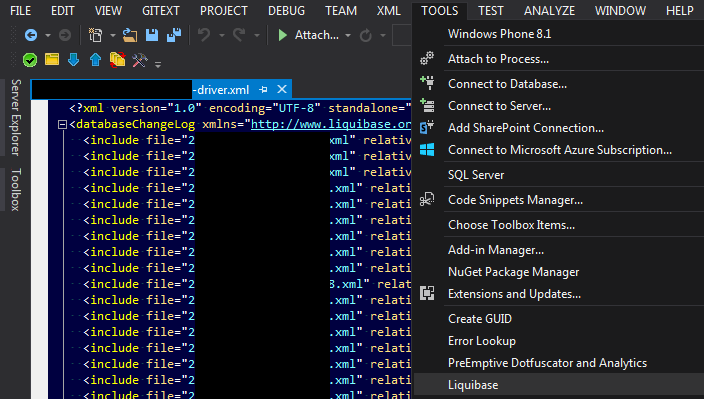 “driver file”) from Visual Studio).
.* truncated the DATABASECHANGELOG table, dropped all affected tables and ran the driver file. The bug I am encountering now appears only on when the conditions are right. I created a new AJAX-enabled website project in Visual Studio 2008 with C# as my code-behind. I downloaded the latest (as of time of writing) version of CKEditor 3.5.2 and CKEditor.Net 3.5.2 control from their website. If you try to view it by debugging it (hit CTRL+F5 while on VS2008), you should see the CKEditor.Net Control working as intended. Now if we put the CKEditor.Net control inside an update panel, it would still work. If the update panel contains a multiview control with only one view panel and the CKEditor.Net control is inside the only view panel, it would still also work. But once the multiview control has two or more view panels and the CKEditor.Net control is on the second view panel (or any panel for that matter, as long as it is not on the default active view index of the multiview) that’s where things start to get ugly. Error: Sys.ScriptLoadFailedException: The script '/CKEditorMultiview/ckeditor/ckeditor.js?t=B1GG4Z6' could not be loaded. As I’ve said at the start of this post, I have not yet found a solution to this problem. If you have any information on how to fix this particular problem, kindly drop me a line at the comments. Thanks! The FCKeditor is hosted at Sourceforge. Click on the link and download the latest version of the FCKeditor main code (fig. 1) and FCKeditor.Net control (fig. 2.). Each has their own sub folder so you may have to browse through them to get to the actual .zip file. For this example, the versions that we got are 2.6.6 for the main code and 2.6.3 for the ASP.NET control. Right-click on the web site project and add the ASP.NET folder “Bin” (fig. 3.). Right-click on the Bin folder and click “Add Existing Item” then browse to where you extracted the FCKeditor Control for .NET (c:FCKFCKeditor.Net_2.6.3binRelease2.0). Select the FredCK.FCKeditorV2.dll assembly file and click the Add button (fig. 4). Go to where you extracted the FCKeditor main code (c:FCKFCKeditor_2.6.6) then right-click and copy the “fckeditor” folder. Go back to Visual Studio and right-click on the web site project and click paste (your Solution Explorer should look something like in fig. 5.). Before we can use the FCKeditor control, we must register it in our application. We have two options to do this: a.) per page via register directive (see listing 1) or b.) per application via Web.Config file (see listing 2). If we use the second option, open the Web.Config file and locate the “controls” node under configuration <system.web> pages then create the “add” node similar to line 5 in listing 2. I prefer to use this method because you only need to do it once and every page in our application can use the FCKeditor. 🙂 or any other control for that matter. 8. You can access the user’s input text with formatting by using the Value property of the control (listing 4).